When it comes to exercise advice, it seems everyone has a different opinion on the best way to workout and get results. For example, some people may tell you that an online personal trainer is the best way to lose fat, while others will argue that you should be in the gym 24/7 working out. So how do you know what advice you should heed? #1: You should ALWAYS workout with an empty stomach to burn more fat. Let’s start with the rationale behind this advice. The idea is that exercising without eating anything first forces your body to tap into your fat stores for fuel. So does it work? What does the research show? Well, here’s where it gets confusing — there is science to support both — that it works and that it doesn’t! There are some cases where people have a pre workout shake before they start exercising and this is something which a few people are starting to do. But just because it is popular to have a shake pre workout doesn’t mean that you have to do it yourself. It’s a good idea to test it out first and then see if it works for you. For example, one 2013 study published in the British Journal of Nutrition found that subjects who exercised first thing in the morning on an empty stomach burned 20 percent more fat than those who had breakfast first. Another study published in 2010 in the Journal of Physiology found that sweating before eating may help prevent weight gain and maintain insulin sensitivity, especially with a fat-rich diet (subjects were all intentionally fed a high sugar and high fat diet during the study to better demonstrate the positive effects, if any, of working out without eating). OK, so it sounds like you shouldn’t eat before a workout, right? Not exactly. Another report published in the Strength and Conditioning Journal in 2011 found that your body burns, on average, the same amount of fat whether you eat before or after a workout. Not only that, but they also found that you are also more likely to lose more muscle and experience a drop in the intensity and overall calorie burn of your workout when exercising on an empty stomach. What’s more, another 2002 study found that women who consumed 45 grams of carbohydrates (via a carb-rich drink) prior to working out ended up eating less calories overall for the rest of the day. Super confused as to what to do? It’s hard not to be! This is where your personal preference and body’s needs have to come into play. If working out on an empty stomach makes you feel dizzy, nauseous and or lethargic, then forget it! If your body doesn’t like running on empty, you won’t be able to have the energy you need to perform your best during your workout. Now how is that going to help you burn more fat? On the other hand, if you wake up early to workout and just can’t stomach anything beforehand but feel fine, energetic, etc. during your exercise session, then feel free to sweat it out without eating first. The bottom line on this one: Eating or not eating before a workout should be based on how you feel, your schedule, personal preferences and daily caloric needs for your goals — not on the idea that you will burn more fat by fasting. #2: Women shouldn’t lift anything over 3 pounds. Or, at the opposite end of the spectrum, if you aren’t lifting heavy weight, you shouldn’t bother lifting at all! Sadly, both of these philosophies continue to be shared by many high profile trainers, so it’s no wonder many of us feel so lost when it comes to figuring out the best way to strength train. First, let’s tackle why you shouldn’t shy away from lifting heavier weights. The idea behind the warning not to lift heavier weights is that it will add “bulk” to your body and make you bigger overall. Ask anyone who has ever seen a female bodybuilder train, and they will tell you how hard they work to gain the muscle mass they have. It’s not exactly easy to pack on tons of muscle — it takes a lot of dedication to not only lifting heavy weight, but to following a very specific, regimented diet too. Think about it: how many things do you lift repeatedly during your day that weigh more than 3 pounds? Your kids (for one), grocery bags, backpacks or an over-stuffed purse, perhaps? Maybe your fitness goal isn’t to compete in a body building competition, but that doesn’t mean you have to shy away from strength training with heavier weight – in fact, you should embrace it. Adding more muscle to your body (which can be done efficiently by lifting heavier loads) helps you burn more calories around the clock, improve your overall strength and stamina and may even build bone density, so it’s a great idea to pump some iron on a weekly basis. But does that mean you should subscribe to the ‘go hard or go home’ mentality when it comes to lifting? Not necessarily. There is actually some value in lifting lighter weights too. Especially if you are dealing with an injury or other physical limitations, light weight may be all that you can safely handle during some exercises. And the good news is that studies show that when worked to the point of fatigue, lighter weights can be just as effective at building muscle and strength. In fact, one recent study published in the Journal of Applied Physiology found similar benefits when comparing strength training with heavier loads and less reps to lighter loads using more reps. A separate study published in the journal Applied Physiology, Nutrition and Metabolism, also found that using lighter weights and higher repetitions was equally effective in stimulating muscle proteins when compared to heavier intensity and lower repetitions. Just remember that whether you choose to lift light or heavy (we recommend a mix of both here on JESSICASMITHTV), good form is crucial not only for results but for preventing injury when it comes to resistance training – at any weight. The bottom line on this one: When it comes to lifting weights, choose the amount that’s appropriate for your body’s capabilities and limitations, not because you are afraid you’ll bulk up if you lift anything heavier than a chihuahua (you won’t). #3: Don’t stop working out because if you do, your muscles will turn into fat. While this one may feel true, it’s not. It’s actually impossible for muscle tissue to shape shift it’s form into fat tissue. The reality is that you may notice after a few weeks of not working out that your muscles are beginning to appear less prominent as they begin to atrophy (or shrink) and you increase your levels of body fat. Many people will tell you that you should work out everyday for the best results, while others warn that this leads to burn out and fatigue. For more information on how much you should be working out, you might want to check out something like Students Fitness. Interestingly, some research indicates that the rate at which your muscles atrophy directly correlates with how fit you are and how consistently you’ll been training. Meaning that if you’ve only been exercising for two months or less you’ll lose fitness gains faster than if you’ve been training for a year or longer (definitely more motivation to stick with a regular exercise plan!). The bottom line on this one: Muscle tissue can’t morph into fat tissue, but muscles do atrophy and shrink without regular training, which can result in a decrease in your overall calorie burn. Decreasing your daily calorie burn could also cause your body fat levels to increase, which makes sticking with a regular workout routine a really good idea. #4: The best time to workout is first thing in the morning. Many experts argue that it’s better to work out first thing in the morning (and on an empty stomach — see #1) because you’ll be more likely to fit it in before the day begins and your schedule starts to get crazy. So is this true? It depends. On YOU. The reality is that the best time to workout is the time you’ll actually do it! While there are benefits to working out in the morning (one study showed that morning exercisers may sleep better) working out in the evening can have it’s benefits too — one study found that when they compared two groups of cyclists, those who worked out at 6pm had higher power outputs than those who pedaled at 6am. Here’s the thing: if you are NOT a morning person and it takes everything you have just to roll out of bed in the morning to get to work on time, an early morning workout may not be the right fit for you. Some people find they come alive in the evenings, and enjoy working out after a long, stressful day at work. Others may find that if they don’t do it first thing in the morning they won’t do it at all because the rest of the day gets too hectic. The best way to figure out what works best for you is to experiment and to be open to change. And, keep in mind that you may need to break up your workout time in order to make it fit for you. Maybe a 10-15 minute session in the morning, afternoon and evening works better for your day. There are plenty of options when it comes to finding your optimal workout routine. If you do decide that mornings work best for you, be sure to roll your bedtime back early enough to ensure you are still logging in plenty of quality sleep. Otherwise your workout may not be doing as much good since not getting enough sleep can actually cause weight gain and could have a negative affect on your energy level and ability to complete your workout. The bottom line on this one: Working out in the morning isn’t the only way to produce results with an exercise routine. What’s most important isn’t necessarily the timing, but rather the consistency, of your workouts. #5: Running is the best way to lose weight. If you don’t exercise regularly, you’re already losing plenty of muscle and gaining fat. Wayne Westcott, Ph.D., author of the book No More Cellulite: A Proven 8-Week Program for a Firmer, Fitter Body, says that starting around age 25, women who do not regularly exercise lose an average of five pounds of muscle per decade and gain 15 pounds of fat. Yikes! Why is maintaining muscle so important? Muscle tissue burns more calories at rest than fat. While we’re not sure on the exact number (some estimates say 1 pound of muscle burns an extra 10-50 calories per day at rest, which doesn’t sound like much but it adds up over time!) we do know it is more metabolically active than fat tissue. Resistance training builds lean muscle mass that helps bring shape and definition to your body (think a more lifted behind, tighter, flatter abs, flab-fee arms, etc), while running alone simply burns calories. That means you could be losing weight (and potentially muscle tissue too) if you are just focusing on running. By combining both cardio and resistance training into your regular workout routine, you are helping your body burn calories more efficiently and keeping your metabolism ‘running’ high. And, there is no magic in running – while it does burn calories, so do plenty of other workouts. In fact, one study found that the explosive, multi muscle type moves used in kettle bell style training actually burns more calories per minute than running (and so does circuit style weight training, HIIT style cardio intervals and so on…). So if you don’t love running, don’t worry, there are plenty of other ways to reach your fitness and weight loss goals! Of course, while all of this is important, It’s also crucial to note that any workout – resistance training or running – won’t produce any weight or fat loss if you don’t also pairit with a healthy diet that includes a caloric deficit too. The bottom line on this one: You’ll lose more weight more quickly by doing a combination of both aerobics and strength training, not simply running (not to mention your body will have better shape and definition too). #6: Heated workouts (or those that cause you to sweat a LOT) burn more calories/help you lose weight faster. We know you’ve done it — after walking out of that heated bikram yoga or intense spinning class you go hop on the scale only to find yourself a few pounds lighter (hurray!). Does that mean that super sweaty workouts are more effective and can help you slim down faster? Sorry, but no, says Michele Olson, Ph.D., professor of exercise science at Auburn University in Alabama. “The reason we sweat is to control our body’s temperature. When liquid hits our skin (from the inside) and then evaporates, the evaporation is cooling. However, this is not the most accurate indicator of how intensely you are working out or how many calories you are expending. In fact, you actually burn more calories running outdoors in the cold versus summer in the heat,” she explains. How? To warm our bodies, our muscles will perform extra small and rapid contractions that are usually not felt, but anytime your muscles contract more, they use extra calories. Heat is released every time a calorie is burned — and this is what helps keep the body’s core temperature up and stable. Sometimes the twitching is very noticeable and we call it shivering. But, the process of sweating does not require active calorie burning, Olson notes. But what about that “weight loss” you noticed on the scale after class? The drop in your scale weight is simply a reflection of the fluid lost from sweat and as soon as you rehydrate (which you should, immediately!) the number on the scale will go right back to where it was before your workout. If only it was that easy to lose a few actual pounds of fat in an hour or less! The bottom line on this one: Olson says don’t rely on sweat as your gauge of exercise intensity. A combination of heart rate and perceived effort are much better indicators of how hard you are working and how much energy (aka calories) you are expending. #7: For longer, leaner muscles stick with yoga, pilates or barre workouts. As for making your muscles longer, that’s impossible. “Muscles have a set length once we reach maturity,” says Olson. “You cannot make a muscle permanently longer.” You can, however, build flexibility and core strength, which means you may be more likely to stand taller and appear longer, but its not because you have actually increased the length of your muscles. Barre, Pilates and even yoga exercises can help improve posture, which may help contribute to the feeling that you are somehow ‘longer’ or taller after training. The bottom line on this one: There are plenty of benefits to Pilates, barre and yoga sessions including a stronger core, greater flexibility and better posture — just don’t expect to come out with a longer or leaner version of the muscles in your body. Finally, when it comes to deciding what kind of exercise advice to follow, don’t forget that sometimes you already know the best way for your body to get in shape. Next time you hear an exercise ‘tip’, ask yourself if that advice makes sense to you, or if it resonates with your personal beliefs. There are many ways to get in shape, but the best way for YOU is what works best for YOU. Sometimes that means letting your internal voice drown out the experts (well, maybe except for when that internal voice says it wants to eat an entire bag of chips on the couch). Looking for a sane workout program that isn’t a bunch of gimmicks or full of impossible, high impact moves like burpees and tuck jumps? Then don’t miss our “Walk On: 21 Day Weight Loss Plan!” Featuring low impact HIIT, standing abs, cardio strength training and even a stress-relieving chair stretch, this balanced program is designed to help all levels of exercisers maximize their fat burning potential without draining energy or motivation. Tell us, what’s the WORST piece of fitness advice you’ve ever heard? Share with us in the comments below! I have worked out at gyms and have done workout videos at home (The Firm Workouts were my go to), and I have gotten in shape. But I have had back issues for years, and that has always brought my workouts to a hault in one way or another. Once I found Jessica’s workouts, I haven’t had any issues with my back because my core is stronger than it has ever been. I also never feel wiped out after doing her videos, but I do feel that I’ve had a great workout! I am thinner and healthier than I have been in a long time. I isten to this young woman because I feel she is all about our best interests physically and mentally. Love her! This is from a long time ago, but I remember being in grade school and being scolded for getting a drink in the middle of a run. “You’ll get cramps!” It felt like the right thing to do. Turns out, I was right! Now everyone knows that you should drink water. LOVE you for quoting Michele Olson. Love your channel. I use it religiously since quitting running. Thanks. The worst workout advice I heard was the mantra ‘Pain is weakness leaving the body’. There are many gyms promoting Cross-Fit type exercises which intimidate me. I’m 57 years old (soon to be 58) and I already have enough chronic aches from my everyday life, the last thing I need is an injury because I tried to do a routine more suited to someone decades younger. I love your workouts, Jessica. I follow along with your mom on some of the moves and challenge myself to keep up with you and Beth, too. And Peanut is always an added treat to see! Your workouts are phenomenal, thank you so much! The worst advice I’ve heard was when I was very young and taking ballet classes. Our teacher would tell us, “If it doesn’t hurt, you’re doing it wrong.” That mentality is so harmful! I wish she had explained to us that we need to push ourselves, but that there is a difference between putting in a concerted effort and going to far and getting into the territory of over-exertion and injury. I also really hate when diets will say you can’t eat after a certain time during the day as if all humans have a set-in-stone schedule of when to go to bed, when to eat, etc. Some people work the night shift. Some people want to have something small a little while before bed. It’s not a crime to be hungry! It makes so much sense to just say, “don’t eat for two hours before bedtime unless you are very hungry, then you can have a small bowl of cereal or a yogurt.” That way, instead of blindly following a rule and making themselves miserable, people will learn to listen to their bodies. This one actually came shockingly from my dermatologist (MD). I mentioned I worked out rather intensely sometimes and the skin did not like it. I wanted some tips from her to sooth the discomfort. She asked what kind of excercise I do, I said HIIT and similar where I pump my heart rate up. She looked at me with the wildest stare and shrieked “whichever DOCTOR told you to increase your heart rate?” She told me not to. There really is a lot of bad fitness advice in the media these days. Often it supports the latest diet fad or exercise trend, at the expense of other activities that are really just as effective. My pet peeve is the recent trend against long, low-impact workouts. I’ve read several sources that refer to jogging and other steady endurance activities as a “waste of time” because they don’t burn as many calories or provide the fat-burning effects of interval training and HIIT programs. While I really enjoy HIIT workouts and appreciate their efficiency — especially on busy days — I also love my long, slow jogging sessions. Hiking, jogging, and walking can be a great way to relieve stress, enjoy nature, and yes, even burn fat. I try to make time to get outside for at least an hour or two every weekend for an outdoor workout with my dogs. It really refreshes my spirit and helps me recover from the stress of the work week. 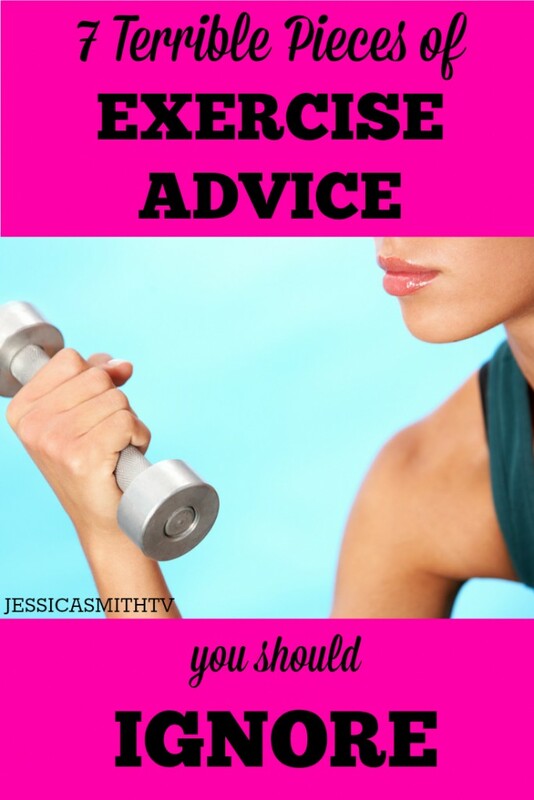 I appreciate your sane and balanced approach to exercise, Jessica! Tonight after completing a gym class session i asked the (not my regular) trainer for signs on how do i know if im over doing it, only because I go to classes 4 to 5 times a week and now have started walking (with a bit of jogging) most mornings. Im doing this because im feeling great and enjoying myseld but wanted to know how to read signs if i need an extra day off etc. I was told running isnt good for me and i need to loose 10kg before even trying and 2 of the gym classes I absolutely loved would do m3 no good as well. This totally killed my spirit. I was having so much fun and being active which i thought was an awesome thing. The more i look into what she said the more i see I was doing well. I was enjoying myself and getting a good balance in. Her advice left me feeling small and… well… fat. Hi Kylie! Don’t let that advice dampen your spirits! What matters most is that you were having fun and staying active, which is awesome 🙂 Keep listening to your body and do what works best for you.